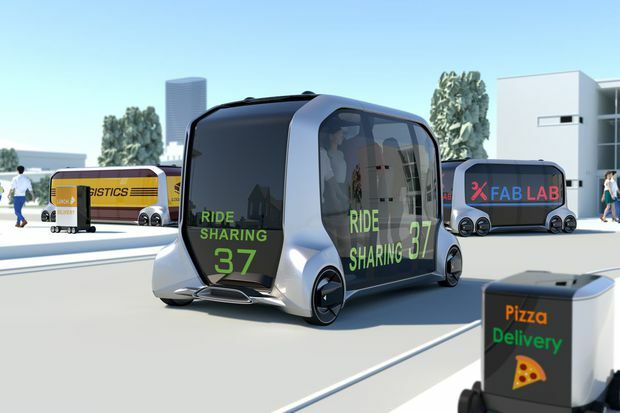 Drive Culture Will Japan have self-driving cars on the road in time for the 2020 Olympics? During the Tokyo Olympics, Toyota's e-Palette will be used to ferry competitors around the Athletes Village. On the first of October, 1964, at precisely 10 a.m., two Hikari Super Express Shinkansen trains pulled into stations at Osaka and Tokyo, respectively. The bullet trains were right on time, and their arrival just weeks before the start of the summer Olympics marked a massive change in transportation for the people of Japan. Now, Tokyo is looking forward to a new Olympics in 2020, and toward a potential new era in mobility. Ambitious infrastructure projects are in full swing, including a new national stadium that threatened to be the most expensive in the world before plans were sent back to the drawing board. Elsewhere, billions of yen are being spent on highway upgrades and a push for hydrogen-powered vehicles. There’s also an initiative to make the 2020 Olympics a showcase for Japanese technology, and in today’s automotive world, that means autonomous vehicles. There are a number of factors that make Tokyo an ideal place for vehicle autonomy to gain wider acceptance. First, there's governmental will behind the decision. Prime Minister Shinzo Abe's government has set ambitious targets for a fleet of self-driving cars by 2020, with aims to make the service commercially viable by 2022. Second, residents of Tokyo are already used to giving up their steering wheels. With expensive toll roads everywhere, heavy traffic and limited parking, owning a car in Japan’s capital city is generally more trouble than it’s worth. In urban environments, a fleet of autonomous cars is likely to generate excited curiosity rather than suspicion. Lastly, there’s the well-developed Japanese infrastructure. With smooth, well maintained toll roads throughout the country, limiting automated functions to specific areas via geo-fencing is a straightforward proposition. However, all is not smooth sailing toward the future. The Olympics themselves, for instance, are set to cost four times their initial budget. The scandal surrounding Nissan chief executive Carlos Ghosn comes at a time when ambitious leadership is required to deliver on the promise of a fleet of fully autonomous electric Nissan Leafs by 2020. Further, while the Japanese government seems generally willing to support the testing of automated vehicles on public roads, official legislation regulating autonomy is not due until next year. In Toyota City, Aichi Prefecture, the mood seems cautiously optimistic. Toyota became an official Olympics and Paralympics partner in 2015 and, as Japan’s largest automaker, is deeply involved in planning for the huge influx of tourists. However, Toyota’s big project is not full autonomy but hydrogen- and hybrid-powered vehicles. The goal is to have some 3,000 fuel-cell and plug-in hybrid vehicles in service for logistics and transportation during the games, including everything from the fuel-cell-powered Sora bus to the Mirai passenger car to fuel-cell forklifts. Honda will also be diving into hydrogen power, and the Japanese government is set to provide about 45.2 billion yen (more than $541-million) in hydrogen infrastructure and subsidies. 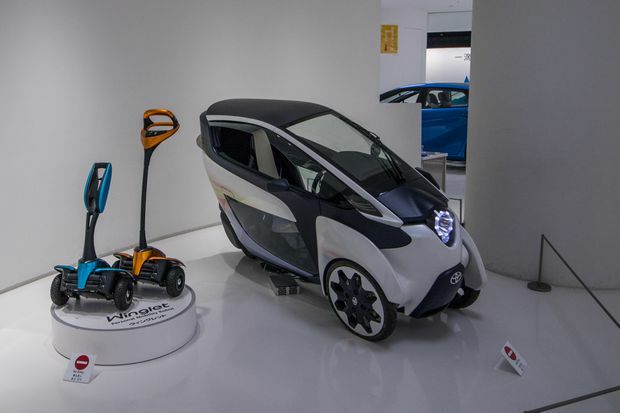 The Toyota i-Road, right, will be used by security teams during the 2020 Olympics. By comparison, Toyota's autonomous vehicles will operate in more of a showcase capacity. Their boxy e-Palette autonomous EV will ferry competitors around the athlete's village, while the Concept-i will be used for demonstrations. On the busy roads beneath Tokyo’s towering concrete overpasses, you can see why the Japanese have evolved a disciplined approach to public transit – just watch any escalator in operation during rush hour, as stationary people stand in a strictly ordered line to the left – but the country’s city traffic is chaotic. Cars and trucks flip on their four-way-flashers and park in the curb lane, while scooters carve up traffic. This is to say nothing of narrow alleyways that aren’t even wide enough for two of the tiny kei-cars to pass abreast, nor of the surprisingly flexible Japanese attitude toward merging. The highways will be easy, but the cut-and-thrust of regular Tokyo traffic presents more of a challenge to computerized brains and sensors. Toyota and others are therefore taking a split-level approach toward automation, with privately owned vehicles proceeding step-by-step through ever greater driver assistance, and full autonomy being deployed experimentally. Toyota’s goal is a zero-accident games, something they hope to achieve with improved automated safety systems. The idea of a car that protects society with pedestrian detection and automated emergency braking is a relatively easy sell to western markets. Toyota's future plans for data collection may not be as easy to translate. For the Olympics, the ability to manage fleet logistics via vehicle tracking makes a great deal of sense. A Japanese acceptance of vehicle telematics being tied to insurance rates, as is currently present in the mid-sized Toyota Crown sedan, might not fly in the North American market. It’s worth noting that the Shinkansen themselves are not without their critics. Their construction had considerable environmental impact, and the long-term effect on Japanese society has been increasing city sprawl and the draining of youth from rural areas. By 2020, vehicle autonomy will be on display in Japan, but still likely in an early phase. The creation of hydrogen-fuelling infrastructure will likely be the larger change in the short term. But perhaps don’t expect upheaval like that driven by Japan’s high-speed rail revolution. The trains arrived, just on time, with the speed of a bullet. Autonomous vehicles, even in highly organized Japan, seem to be plotting a slower course.